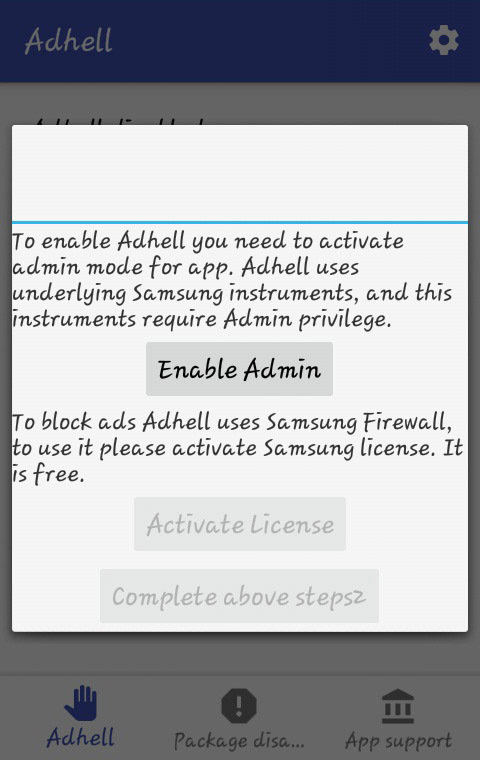 Download AdHell 2: Free Samsung AdBlocker and Package Disabler – How to install? 1 Comment on Download AdHell 2: Free Samsung AdBlocker and Package Disabler – How to install? Update: Adhell 2 is now available for download and can still be installed with Samsung EDU SDK Lisence key just like SABS or notSABS, and Adhell 3; alternatives to Adhell 2. ‘What the hell! Well, this is the exact phrase we exclaim when we see Ads popping up while we use an Android App.It’s very common occurrence to see Ads, mostly when we are using free Apps.The App developer makes money from those Ads. But there have also been cases of illegal Adware, and JUDY Adware is a recent example. So, the question is how users can use an App without the meddling of Ads?. If, you use any Samsung smart device, and wonder how to stop Ads in Samsung Smartphones, then let us tell you about Adhell. Block Pop-up Ads device wide. Disable apps/services that user doesn’t require. block URLs of websites you don’t want to access. How to Block Ads in Samsung Smartphones Using Adhell 2? Adhell now uses Samsung KNOX Standard SDK or Samsung EDU Lisence Key, which provides access to a comprehensive collection of Mobile Device Management (MDM) features. How to get the Samsung EDu Licences key? Go here to view your keys or generate new ones. Go to “Samsung EDU SDK” section. Note: Adhell is only designed to work on Samsung Smart devices exclusively. Adhell will be able to perform its tasks based on it. Able to configure the network rules. Next, on Activating Device Administrator, you will be asked to Enable Admin Privilege so that Adhell could run. You will also be asked to activate Samsung License so that Samsung Firewall could be enabled. Samsung Firewall is the tool used by Adhell to block Ads. Let it be web page running on PC or an Android App, we experience a lot of Ads while we use them. Where do these Ads come from..?. Well, Ads are the source through which the developers earn their revenues.Sounds legit?. It is all right if we see one or two Ads maybe while using our App that too in the corner screens. But if lots of Ads pop-up every other second, that too right on the middle of our workspace, its not an user-friendly App. Heck, it could be illegal Adware/Malware. So, that is where Adhell comes in (provided You use a Samsung device). The user can select the Apps on which Ad ban should take place. select WhiteList Apps to do the same. Whitelisting of Apps is to protect the device from potentially harmful applications. Application whitelisting is the practice of specifying an index of approved software applications that will be run on a device. Well, you can block URLs using Adhell. Any website which you do not wish to visit or You want to keep your children away, just follow these steps. Select To Block/Manage URLs according to Your Requirement. MANAGE STANDARD URL PACKAGE provides the list of a set of URLs which You can further classify as Allowed or Blocked. BLOCK CUSTOM URLs. You can provide the URL of a website which you want to block. This dialog will come up if You press BLOCK CUSTOM URLs. Adhell comes with Package disabler to disable Apps that are not required and is consuming battery of your device. Follow these simple steps to Disable Unused Apps and Debloat your device. Step-1: Go to Package Disabler Option on Adhell. Step-2: Select the application You want to disable and click on “Filter”. The concerned App will be disabled. Select the App which You want to disable, using Package Disabler. So we just learned how to stop Ads in Samsung smartphones using Adhell. We can also BLOCK URLs and Disable Unused Apps. Well, in addition to these features Adhell has got some advantages and disadvantages. Absolutely free (when compared with its competitors). To install/run no rooting of your device is required. Recent update supports devices on Android 7.0 Nougat. It is only available for Samsung smart devices. It is a non-official App, meaning it’s an open-source App that uses Samsung API. You know how to stop Ads in Samsung smartphones using Adhell and disable unused Apps or block URL of any website, You should try it out. It’s a freebie and runs on the latest device as well as supports device on Android Nougat or Oreo. You can also remove it anytime you want. Adhell 2 is now available. Samsung officially have taken down the Adhell from Play Store due to security concerns. Now the developer have released AdHell 2 for the same. Well, here is the latest update on Adhell we want to share. For some reasons, Adhell APK is not being hosted on GoogPlay store anymore. So we are hereby providing You with the new mirror links from where You can easily download the Adhell APK.